Artists worked on an island bluff near the ocean. 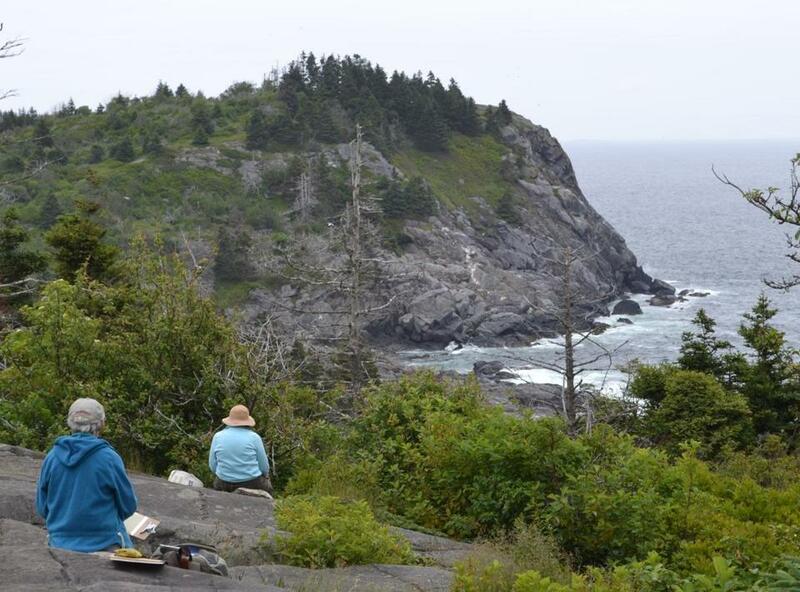 MONHEGAN ISLAND — “Everywhere you look, there’s a painting,” said Alison Hill. We were sitting on the deck of her studio, in a grassy meadow just outside the village. 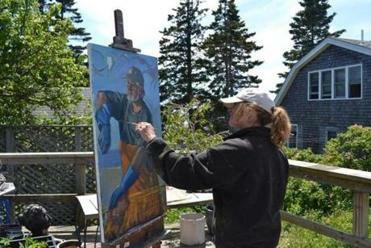 An easel sat upright in the corner, where she was working on a portrait of a local lobsterman. Hill, a petite blonde with a warm smile and friendly manner, was splattered with paint; blotches of yellow, black, and green spotted her shorts and T-shirt. We noticed a particularly brilliant blue splotch on one cheek. “It’s very inspirational to be here,” Hill said, raising her palette and miming the same words we had heard over and over again from artists on this tiny, isolated isle. The island is magical. The light is magnificent. The place has soul. There is a painting everywhere you look. There were also painters everywhere we looked. We had been on the island for a day and already we had seen artists perched on ledges and bluffs, lining the dirt roads, gathering at the edge of the forests, standing with easels propped and brush in hand at Fish Beach, Swim Beach, Pulpit Rock, and Lobster Cove. There were 19 artist studios open to the public (during designated hours or by appointment), and many more artists who had come to the island for a short time to paint or photograph, to carve or draw. “The island’s been an artist colony for generations. It’s in our DNA,” said Bill Boynton, owner of the Lupine Gallery, which exhibits works from more than 50 contemporary and past Monhegan artists. Located 10 miles off the mid-Maine coast, the island has been drawing artists from around the world for more than 150 years. Giants in the US art world have been inspired by Monhegan, including George Bellows, C. K. Chatterton, Randall Davey, Robert Henri, Rockwell Kent, Edward Willis Redfield, Frederick Judd Waugh, and three generations of the Wyeth family: N.C., Andrew, and Jamie. 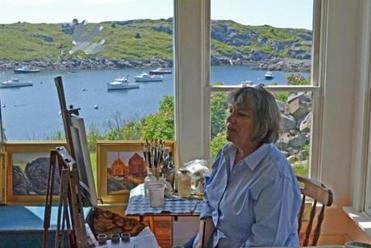 Susan Gilbert painted in her studio overlooking the harbor on Monhegan Island. There’s no doubt there’s something special about this picturesque island, with its rugged cliffs and crashing surf; soft, inland meadows and pristine spruce forests; narrow roads and footpaths; and a down-to-earth, hard-working culture, where fishing and lobstering families still live and work by the tide clock. Change, in the name of progress, has come slowly. Most of the land is protected by Monhegan Associates, dedicated to “preserving and protecting the wild lands of the island and its simple, friendly way of life.” Outside the small village, clustered around the harbor, the island remains delightfully undeveloped. There are 17 miles of hiking trails, leading through forests, over rocky ledges and cliffs, and along the shore, showcasing landscapes, scenes, and vignettes that we have seen in countless paintings. We followed the map showing the location of the island’s artist studios, housed in sea cottages and cedar-shingled homes scattered around the island, many with water and wood vistas, and walls decorated floor to high ceiling with paintings and drawings of Monhegan sites. Alison Hill worked on the deck of her gallery and studio. We had been on the island for two days, and had yet to meet Don Stone, affectionately known as the dean of Monhegan Island artists. Stone, who has won a slew of awards and is arguably the most renowned of contemporary Monhegan artists, has taught hundreds of artists on the island. His studio was closed on our first try; the sign flipped to the side reading: No chance. But word that we were on the island and wanted to speak with him had spread, and on our second try, he swung the door open and greeted us warmly. The studio was stunning: walls covered with Stone’s prized paintings and works in progress, soaring beamed roof and windows with far-reaching views of the water. On our final day, we decided to explore Monhegan, in search of its most famous and widely-painted locations. We walked across the width of the island along the Cathedral Woods trail, under a hushed pine tree canopy, across a soft floor of mushy moss and needles. The trail ended at the bluffs overlooking Squeaker Cove. From here, we walked over rock ledges, with sweeping views of the cliffs, the ocean, and the distant mainland on the horizon. We headed toward Pulpit Rock, an unusual formation at the water’s edge, and rounded the northern end of the island. The trail entered the brush and woods for a short time, before reaching pretty Pebble Beach. Here, we lingered along the shoreline, dipping our toes in the cold tide pools, and snapping our own photos. The trail wrapped back around, heading south to Deadman’s Cove. Next, we explored the trails on the south end of the island. We visited popular Lobster Cove, the site of a rusted old tugboat wreck. More pictures . . . then a hike up the bluffs, over Gull Rock, Burnthead Cliffs, Gull Cove, and Whitehead ledges. Maybe next time, we’ll pack some sketch pads.